What a year. I keep saying that 2010 has been terrible (and it has) but as I looked back through my photos for the year I realized it was also full of a large number of great things. Recapped here for you, 2010 at Casa de Baya. January: I knit a kidney for my mother, who has to have one removed. D and I take a trip to meet friends in Portland, and while he spends an afternoon playing computer games with the hipsters, I am surrounded by yarn and knitters. February: I fly east to help my mother out after her surgery and am able to visit all-too-briefly with my friend Lisa and her husband. It’s a short month, because it always is, thankfully. March: I start seeds for a garden that will eventually produce very little because of a very long, damp and cold spring and a very strange growing season. April: We celebrate D’s birthday with a trip to Portland to see a Q&A with Kevin Smith, and are simultaneously super disappointed to be missing Conan O’Brien’s show here in Eugene (on the same day). We had a fantastic time none-the-less. We also undertake the next step in our massive overhaul in the front yard landscaping that leaves us exhausted and feeling accomplished. May: We spend a large amount of time figuring out just how goofy we can be. June: It’s my 29th birthday, our 3rd wedding anniversary and Black Sheep Gathering all in one action-packed month. My handspun and handknit pygora shawl brings home a perfect score and a 2nd place ribbon at Black Sheep Gathering. July: A far-too-brief pair of visits with one of my too-far-away friends (which reminds me that somewhere there are a few more photos from her visit). We visit with Jodie and Anthony and have a great pizza adventure. There are a few days of hot temps, hot enough that the kitties look like they might melt, but not hot enough to justify the work and cost of moving the window a/c unit into the bedroom to deal with them. August: I spend a lot of time preparing a moderately sized wholesale order of knitting themed cards for a yarn club, and plan to launch my etsy shop (launch does not happen. March, I hope.) There is the continuation of a stressful situation, and we go to an awesome 50s themed party to watch Dr. Strangelove. September: We help our friend April harvest the delicious honey from her apiary and I meet Heidimonkey and Emily for a short romp through the Oregon Flock and Fiber Festival which is more crowded than I have ever seen it and extremely humid due to rain. We eat tiny pies and knit together. November and December which are a flurry of doctors appointments, physical therapists, bed-rest and hoping for results before finally an eventual MRI shows us that he has a badly herniated disc in his back that requires surgery. We manage to have great Thanksgiving and Christmas celebrations in spite of this, and that brings us to now. Now we’re waiting patiently for this trying year to end, and for the surgery to get here and be done with. We’ve got big plans for 2011 and they don’t include being confined to the house for a day longer than necessary. We’re hoping that it’ll be a great year, and I wish the best year ever for all of you out there!! 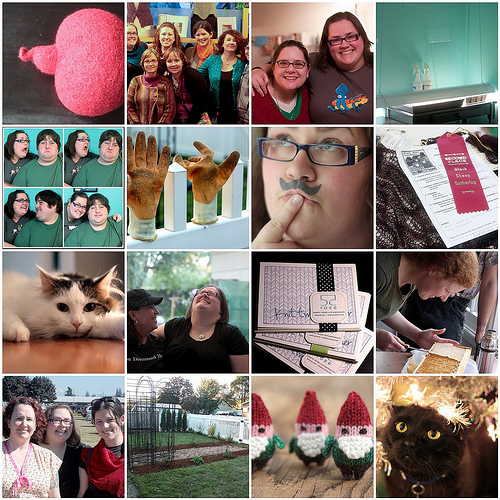 The year in knitting and crafting will be coming soon!